I have been craving some what of a change with my hair for a little while now. I even contemplated whacking at my locks and starting over with comb coils. I get like this every couble of years so I had to think of something quick before I chopped at my hair. So I thought I would treat myself to a salon visit for Demi color and style right. Demi is a semi permanent hair color that covers gray and provides a nice rich coating right. So I called this morning and surprisingly enough the receptionist says that the loctician has a 3:30 PM availability. Wow this must be faith especially with a opening on a Saturday at such short notice. Okay so I get there and I am in the parking lot talking to my hubby. Me - Ah hell this is a regular permie salon. I am so hoping she is not going to have me waiting. Hubby - Well just go in and see what the deal is and I will wait. Me - You know I am not down for waiting on a stylist especially when I have an appointment. So I go in and I speak with the receptionist. Who is unaware of who I am and my appointment and she quickly calls another stylist who comes up walking like yeah you are the 3:30 PM for so and so. Yes I am, I replied. They ask me to take a seat and I wave my husband to leave because I assume my stylist will be right out since I had the attention of the receptionist and another stylist. So the loctician comes and greets me and we chat about what I am looking for. I tell her I don't want to lift my hair color because my hair has become so soft that I am so sure it will unravel at the slightest sign of chemical. She agrees and we decide on a semi permanent hair color. She then says today has been kind of crazy so if you don't mind waiting I will be with you in a second. Then she says if you want to go and get you something to drink or eat from the restaurants down the walk you are more than welcome to do so. COME ON NOW!! That is the secret shop code for girl you better find something to do until I finish this head. Why in the hell did I look at her chair and she was just blow drying this woman out with a brush?? Ah Helll! Then I start reading a magazine and mind you this is 3:50 PM my appointment was at 3:30 PM. I look up again at 4:00 and she was just pulling out some flat irons and straighting the lady. Now we all know that is about another hour on her head until she gets to me. At this point I am furious. I am not accustomed to waiting in anyone's salon and I am a loctician myself so I expect MORE. So what did I kindly do?? I texted my husband and told him the deal. Then I politely got up and walked out. That's right! I walked my behind down the walk like I was going for something to drink and phoned my husband and told him to pick me up. He arrived about 7 minutes later and I was out of that bad boy. I didn't tell her anything. Nothing! Her site states that she is professional and that she expects a call if you will be more than 20 minutes late. Well hell what about me? I am sitting in your salon waiting area for more than 30 minutes and you don't even have me in the chair yet. I don't think so. I can't stand that type of service. That is why my clients can expect to get right in my chair as soon as they cross my threshold. I bring them to the chair and I ask them if they would like anything to drink. I fulfill their drink order and I get started. No if ands buts about it. So what did I decide to do? Well I high tailed it to one of the neighboring beauty supply stores. I purchased some gloves, some plastic caps, and some semi permanent hair color. Here is the bottle. I got home and washed my hair and proceeded to put the semi permanent color in myself. 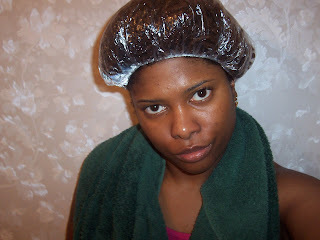 Yup that is right I am under the dryer as I type this post. I just don't have patience for the typical salon experience anymore. I really wanted to treat myself but hey I expect to be serviced upon my appointment time not an hour later. That is one of the reasons I decided to go natural anyway. Oh believe me I know where you're coming from. Fortunately for you, you know how to DIY! So are we going to get to see the end results?! I feel you on this post. 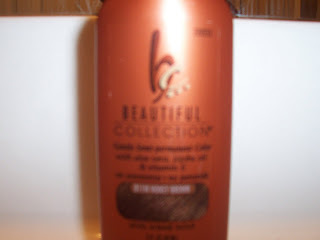 When I use to go to the salon what they would do to me is wash my hair then have me waiting for ever so I cant leave with my head looking all kinds of crazy plus I would have had to pay since they touched my hair and used there product. That I why I am a DIY I do it on MY terms and I don’t have to work around someone else schedule. Thats why I like the loctician I go to now.. He does not over book. When I get to my appointment(on time mind you) he is sitting in his chair waiting. Since I have been natural I get real antsy when I have to wait more than 10 minutes. You Go Girl! I heard that! That pic is to funny, going and sitting and waiting for those prices is for the birds.